Parabolic microphone used at an American college football game. 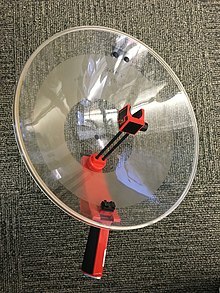 A parabolic microphone is a microphone that uses a parabolic reflector to collect and focus sound waves onto a transducer, in much the same way that a parabolic antenna (e.g., satellite dish) does with radio waves. Parabolic microphones have great sensitivity to sounds in one direction, along the axis of the dish, and can pick up distant sounds. Typical uses of this microphone include nature sound recording such as recording bird calls, field audio for sports broadcasting, and eavesdropping on conversations, for example in espionage and law enforcement. Parabolic microphones were used in many parts of the world as early as World War II, especially by the Japanese. Parabolic microphones are generally not used for high fidelity applications because dishes small enough to be portable have poor low frequency response. This is because, from the Rayleigh criterion, parabolic dishes can only focus waves with a wavelength much smaller than the diameter of their aperture. The wavelength of sound waves at the low end of human hearing (20 Hz) is about 17 metres (56 ft); focusing them would require a dish much larger than this. A typical parabolic microphone dish with a diameter of one metre has little directivity for sound waves longer than 30 cm, corresponding to frequencies below 1 kHz. For higher frequencies, a gain of about 15 dB can be expected, however, when the wavelength of the sound becomes comparable with the diameter of the parabolic dish the response falls away. A shotgun microphone, or a phased array of microphones, may be used as an alternative for applications requiring directional selectivity with high fidelity. ^ Rumsey, Francis; McCormick, Tim (2009). Sound and Recording (6 ed.). 30 Corporate Drive, Sulte 400, Burlington, MA 01803, USA: Elsevler Ltd. p. 60. ISBN 978-0-240-52163-3. This page was last edited on 17 February 2018, at 17:24 (UTC).